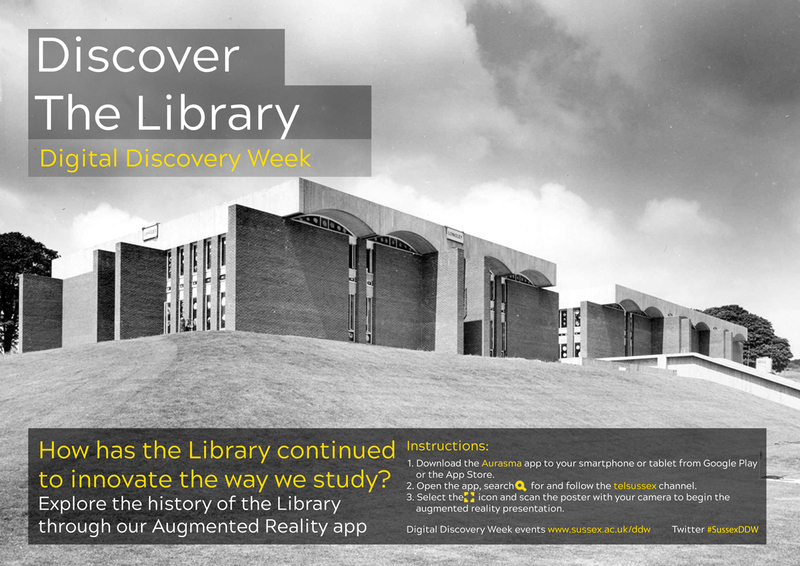 As part of Digital Discovery Week, myself (Pete Sparkes, Learning Technologist) and Bethany Logan (Research Support Supervisor, Library) used technology to create a series of interactive posters using augmented reality (dubbed ‘Discover Campus’) to provide bite-sized, location-based digital learning resources across campus. 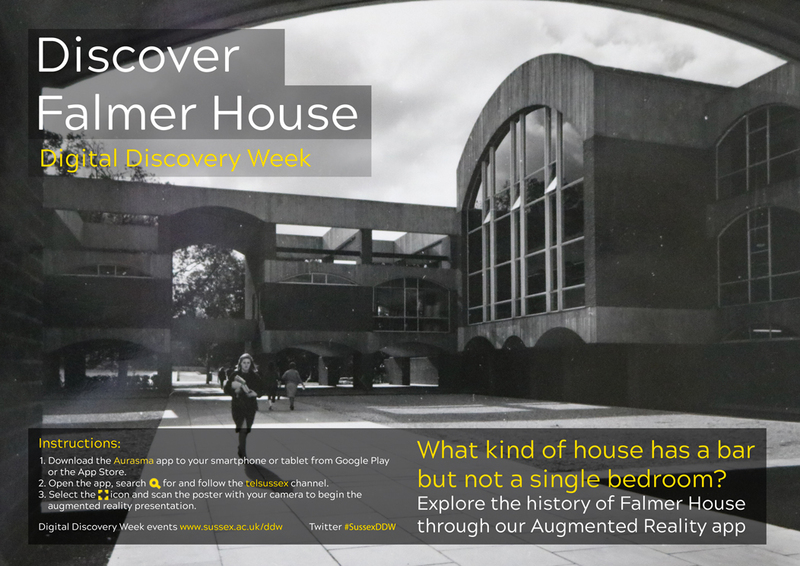 The use of this technology enabled us to present a historical narrative, supported by a video montage of photos from archival collections at The Keep, presenting the history of Falmer House (Students’ Union), the Library and the Arts buildings which staff, students and visitors alike could engage with through their smartphones and tablets. Click on the image below to watch a brief Youtube video demonstration of the posters in action. Empower staff, students and visitors to interact and engage with the history of the university in a new and unique way. Connect historical narratives to their physical locations in an easily accessible manner. Explore opportunities for promoting engagement with archival materials. Demonstrate the potential of augmented reality technology as a tool and medium for teaching and learning. You can view the content yourself by following the instructions below – if you’re not on campus then you can follow the same instructions to interact with the digitized copies of the posters that we have included below in this blog post. Download the HP Reveal app (from Google Play or the App Store) onto either a smartphone or tablet. Open the app and follow the telsussex channel. With the app open – scan the poster with your camera. If you’re feeling lazy, then you can skip the apps and posters and view the videos on the Sussex TEL Youtube channel. Augmented Reality (AR) is a term used to describe digital technologies which enhance the experience of how we perceive real-world physical objects by overlaying and integrating it with digital content and information. This convergence of the physical world and technology has the potential to transform the way that we perceive and engage with learning. As explained by HowStuffWorks in their AR 101: The Basics of Augmented Reality video (which I would suggest watching if you’re new to AR), “a really powerful, universal AR app could turn the physical world around you into an encyclopedia, tour guide and repair manual all in one”. Examples of AR date back to 1960s, although it is only recently that technology has started to catch up with this idea. A few recent examples in popular culture include the location-based mobile game Pokemon Go and the use of masks in Snapchat, the multimedia messaging mobile app. A number of universities have also started to embrace AR to enhance teaching and learning through interactive walks to analyse safety risks, provide access to rare-books, as a creative means for students to present information and more. Although there are already many examples, according a report from Ericsson; we are likely to start realising the full potential of AR from 2020 onwards, inline with the public roll-out of 5G which is set to introduce a new wave of mobile technology. The technical concept behind the Discover Campus project was that a poster would act as a visual trigger, playing a video when scanned using a camera on a smartphone or tablet. The posters would be based on different locations around campus, so that each video would tell a snapshot story about the development, people and events behind the history of the building. The development process was split into 5 separate phases to produce each of the required elements to bring this project together. Locate and curate historic photos and source materials of University of Sussex for use in the posters the videos. Write a set of narratives and storyboards based on different locations on campus – making sure that the narratives complement the visual materials. Produce videos based on each storyboard using the materials and record a voice over for the narrative. Create a poster for each of the videos. Use the HP Reveal app to create the augmented reality experiences. As the content would be presented through a mix of posters and videos, it was important to have strong visual materials to base our narratives on. 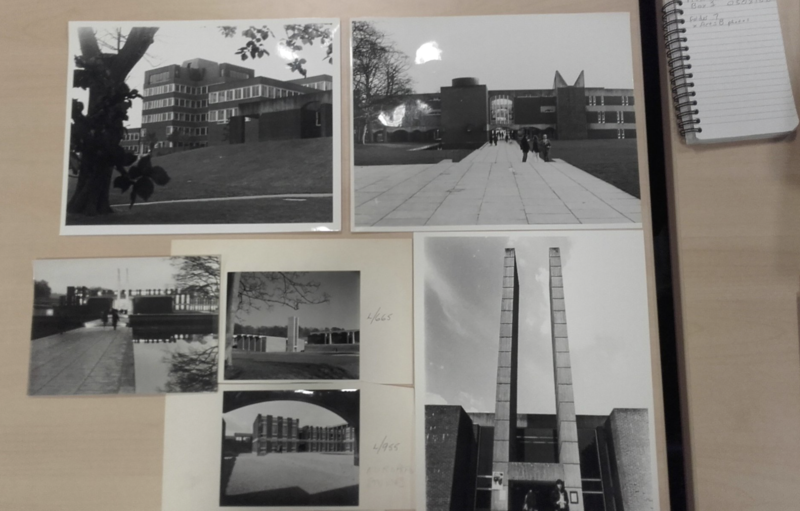 The Keep (archive and historical resource centre for Brighton and Sussex) includes a wealth of historic photos, articles, technical drawings and materials on the University of Sussex amongst its collections. We spent a couple of afternoons sorting and curating materials from their collections, which we whittled down to 100 items that could potentially be used for our project. With the permission of the archive, we then photographed these items as a means of digitizing the materials we wanted to use. The photos were then used as a starting point for creating three storyboards – one for each video based on the three locations. Storyboarding is a vital part of planning any video project, ensuring that there is clear direction during the production process and that it runs smoothly. Our storyboards consisted of a document containing a timeline of the photos and narrative dialogue, drawn from books within the University Library, in the order of where they would appear in the video. We then used Adobe Photoshop to produce the posters and edit the photos for our videos and Adobe Premiere (both Adobe products available to all staff and students on the University software center) to piece together the photo montage videos and record our narratives over the top. Once we had created our posters (trigger image) and videos (triggered content), we had the ingredients we needed to create our augmented reality experiences. We evaluated a few different AR apps including Unity, Vuforia, Blippar and Metaverse, but decided to use Aurasma (now called HP Reveal) due to its functionality and what we perceived as its ease of use. We ran into some issues whilst trying to create our AR experiences due to strange behaviours where the tool didn’t seem to synchronize or behave consistently between the app and web-browser versions. Eventually we had to create a completely new account and then use the app exclusively so that the software didn’t get confused. Though this was frustrating, the app was more than capable of meeting our needs to complete the project. 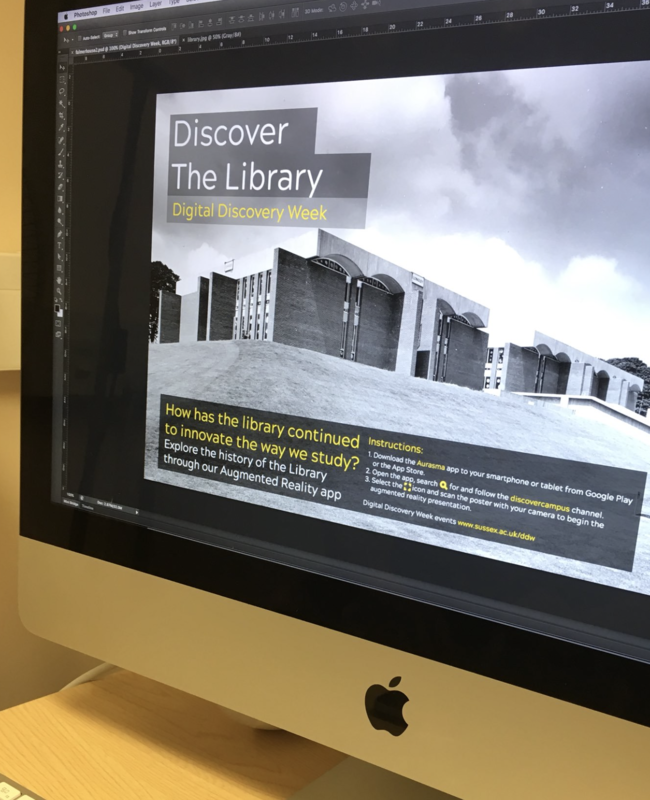 The posters were then printed in A3 size and placed in relevant locations around campus for the duration of Digital Discovery Week (6th – 10th Nov, 2017). The posters also formed part of the “Making the invisible, visible” exhibition during the week. 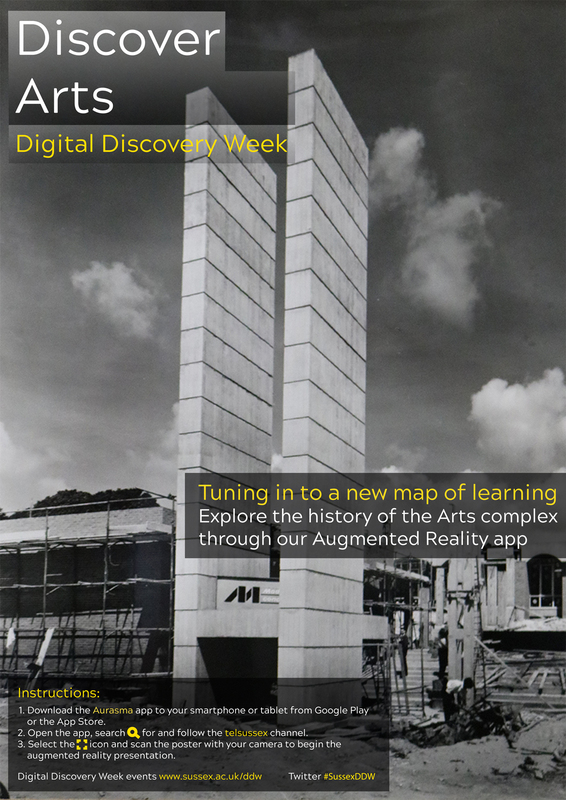 See the following blog post for a review of Digital Discovery Week. 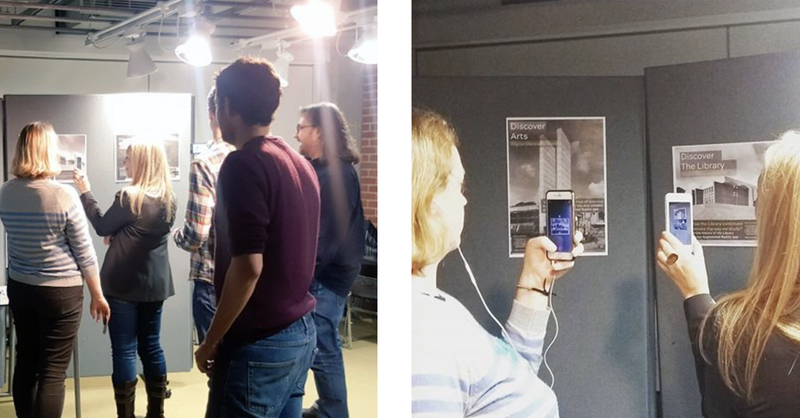 1 Pings/Trackbacks for "Discover Campus: using augmented reality to learn about the history of our University"